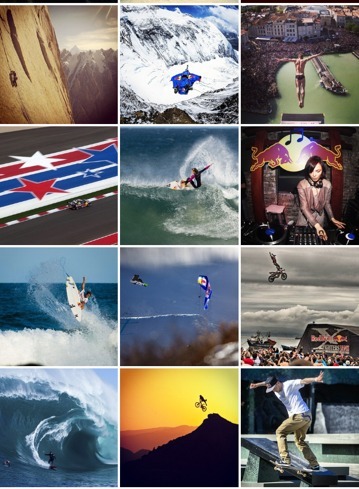 Is GoPro copycatting Red Bull? Don’t get me wrong, I love GoPro. I follow them on Instagram, and regularly like and share the stunning photographs and footage you could not capture without their state-of-the art camera gear. And so as I have been following their every Insta move intently, I couldn’t help notice that they are starting to resemble another big favourite brand of mine – Red Bull. Incidentally (or not), Red Bull has its own web TV channel and is a fully-fledged multi-platform media company too. Now… one may rightly argue they have got something major in common: their target audience. Both brands are not for the faint-hearted but for the adventurous and sporty types amongst us. They are particularly big on extreme sports enthusiasts. Just take a look at the 2 snapshots below of their Instagram feeds – you could easily swap images around. The one saving grace is the Red Bull branding being prominent as you scroll through the feed. A shared target audience partly explains how their NPD efforts and marketing tactics may cross over. 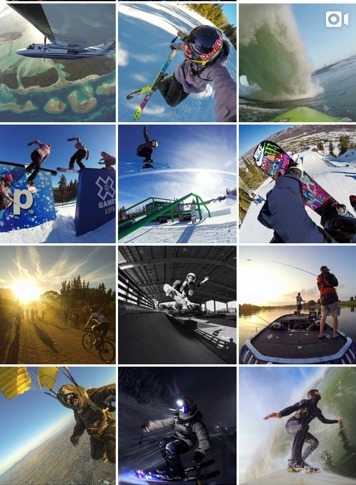 GoPro is also by the very nature of its product a great source of content, with their move onto the Xbox platform the next logical step of an existing multi-channel content distribution strategy. However, how many glaring similarities can a brand get away with before it becomes detrimental to the brand image itself? How sustainable can it be as a business strategy? If your brand stands for adventure and versatility, how could one’s perception of it as a copycat be a good thing? In my view, to dispel any doubts in the consumers’ mind, GoPro ought to work harder on finding its own creative voice and key differentiator. That or it may face the risk of becoming uncool amongst the cool, edgy audience it is trying so hard to woo. Copycat brands have never been popular to my knowledge – if you know of one, please hit reply and share your thoughts with us. I genuinely can’t think of any as I write this. As a further test, I did a quick search on Google scanning for any public outcry over what strikes me as a lack of creativity. And I saw that AdWeek did very recently touch on this topic. Their article title was a give-away: GoPro’s Super Bowl ad looks a lot like Red Bull, Circa 2012. GoPro may be forgiven for wanting to share some of the limelight on the Stratos jump – the footage was captured with their cameras after all. It’s just that the Stratos jump has been done to death. Also, their Super Bowl TV ad is heavily, well, Red Bull-branded. Enough said.